* Published in the January-February 1989 The Crabbet Influence in Arabians Today Magazine. Lewisfield was a farm with an exceptional breeding program which produced a U.S. National Park Champion, a U.S. Reserve National Champion Stallion, and numerous top ten and regional winners in halter and performance. 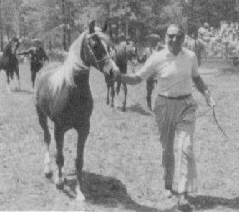 Although the program was fully active for just a decade from 1960-1970, many breeders have been enriched by having a Lewisfield horse in their own pedigrees. Lewisfield Sun God (Aaraf x Aarafa) pictured above and below right had a brilliant show career cut short when he foundered. Lewisfield was located in Charlottesville, Virginia, and was owned by Mr. and Mrs. F. Lewis, Jr. and James Fielding Lewis III. The farm itself, with its acres of verdant hills, was a virtual paradise for the Arabian horses who lived there. The Lewises also bred champion cattle at another facility and several breeds of dogs, including Rhodesian Ridgebacks, Labrador Retrievers, and Bull terriers. The Lewises also had a spectacular collection of horse art (depicted in the 1965 farm brochure “The Look of Eagles”) and commissioned oils of their favorite stallions from Edwin Bogucki as well as a bronze of their favorite park horse, Lewisfield Nizzoro. In 1959 the Lewises returned to ownership of Arabian horses after a twelve month study of bloodlines to determine which were the best for their purposes. The Lewises had a very clear picture of what they wished to achieve – an elegant horse of good height with a beautiful Arabian head, straight legs, and good action at the trot AND all other gaits. Basically, the Lewises wished to recreate Lady Wentworth’s “superhorse,” of whom Indian Magic was considered the ideal example. They called this type of Arabian bred by them the “Lewisfield Look” – modern Crabbet at its best. The first group of horses purchased by the Lewises was the high quality nucleus of the famed Ben Hur stud of Herbert Tormohlen of Indiana, distinguished by the horses, whose names began with a double ‘A’. Tormohlen’s program was based on that of the Maynesboro Stud of W.R. Brown and was predominately Crabbet with Davenport and Hamidie and an Egyptian line through *Aziza. Included in this purchase were the Azkar (Rahas x *Aziza) daughters Aazdura (x Aadah), Aazalia (x Aarafa), Aaziza (x Aarafa), and Aazkara (x Aarah), all producers of champions. There were two daughters of Gulastra: Aalastra (x Nadirat) and Aastra (x Aadraffa). Other mares included Aadah (Aabab x Aabella), Aadura (Indraff x Aadah), Aalwyna (Aaraf x Aahlwe), halter and park champion Aazara (Aaraf x Aazkara), and park reserve champion Aazrafa (Aaraf x Aazkara). Also included in the first group purchase were the full brother and sister, Aaraf and Aarafa, both champions, by *Raffles out of Aarah. The stallion Aalzar (Azkar x Aahlwe) was part of the group. Lewisfield Bold Hawk++, half-brother to Lewisfield Sun God out of Aarafa was U.S. Reserve National Champion Stallion to *Bask, shown here at 13 years of age. Judith photo. From this initial purchase came the outstanding Lewisfield horses. Aaraf sired two National winners and the exquisite halter champion stallion Lewisfield Sun God (out of Aaraf’s full sister, Aarafa). Lewisfield Sun God was foundered at age three during a brilliant show career. To many who had the privilege of seeing him he embodied the epitomy of Arabian type. Aarafa produced a total of four champions at Lewisfield, including her son Lewisfield Bold Hawk++ (by Aalzar), who was named U.S. Reserve National Champion Stallion (to *Bask) and U.S. Top Ten English Pleasure. 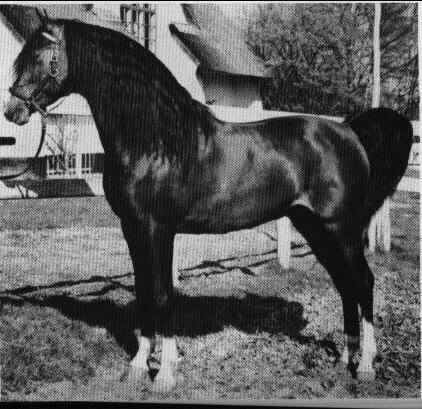 Lewisfield Bold Hawk++ sired champions in halter and performance and was used at stud at Lewisfield through 1969. Aarafa also produced halter champion Lewisfield Nizrif (by *Nizzam) and English Pleasure AOTR reserve champion Lewisfield Smoke (by Royal Storm). Aarafa’s daughters by Azkar, Aaziza and Aazalia, both produced champions for Lewisfield, as did Lewisfield Sun God’s full sister, Aarafaa. Other exceptional producers in the initial purchase included Aadah (whose daughter by Aaraf, Aahfora, produced five champions and three National winners), Aalastra (dam of Region 7 Champion Park Horse Lewisfield Nizzoro by *Nizzam), Aalwyna (whose daughter Heritage Reverie has produced seven champions, three of them National winners), Aadura (dam of U.S. Top Ten Formal Combination Aaduraf), Aalzar (sire of Lewisfield Bold Hawk++ and National winner producer Lewisfield Spring Rain), Aabona (dam of U.S. Top Ten Mare Lewisfield Nizzaba, the dam of four champions), and Aaziza (dam of four park champions: East Coast Champion Park Lewisfield Nizizo++, park champion Lewisfield Nizzamo, halter champion Lewisfield Nizziza, and East Coast Top Five Park Zora, all by *Nizzam). Lewisfield Nizani (*Nizzam x Griffin) at age 16 with Melanie Gavitt up winning Reserve Park Champion, Elmira, NY Charity Show in September 1981. Owned by Richard Higley for most of his life, he is now age 23 and enjoying a useful breeding and riding life with his new owners Wayne and Ruthann Gavitt of Forksville, PA. The Ben Hur group was outstanding, but Lewisfield did purchase or use a few other horses who were not as successful for the farm. Neeraf, a double *Raffles horse, was bought and gelded after siring one foal. He was subsequently named 1962 East Coast Champion Gelding and Western Pleasure. Ironically, his one foal was Lewisfield Reverie, dam of seven champions and three National winners! Lewisfield also stood the *Raffles son, Charaff, for the 1961 season but did not retain any of his offspring. The next group of mares acquired by Lewisfield included the Cedardell mares Imafara (Imaraff x Fa-Rahna), Griffin (Garaff x L’Aida), Griffin Sprite (Tsali x Griffin), Golden Fantasy (Tsali x Mahroussa), and her full sister Winsome Lass. Imafara produced three champions (including Canadian Top Ten Stallion Ambassador, halter champion Lewisfield Nizzar by *Nizzam, halter champion and champion producer Lewisfield Gusto by El Gato, and National winner producer Lewisfield Spring Rain). Griffin produced four lifetime champions including Canadian Top Ten Mare Sahra Saade (by Tsali), halter champion and champion producer Lewisfield Amigo (by Tsali), and pleasure driving reserve champion Lewisfield Nizani (by *Nizzam). 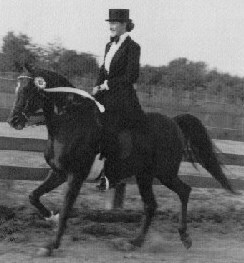 Her daughter Griffin Sprite was also a good producer for Lewisfield, with halter reserve champion Lewisfield Dream (by *Touch of Magic) and U.S. Top Ten Mare Lewisfield Sprite (also by *Touch of Magic and dam of three champions). Golden Fantasy produced 1968 East Coast Top Five Western Pleasure Lewisfield Nizzax (by *Nizzam) and champion producer Touch of Fantasy (by *Touch of Magic). Golden Fantasy was also a halter champion. Her full sister Winsome Lass produced three lifetime champions, including 1977 and 1978 Region 15 Champion Park Lewisfield Falcon (by El Gato). Due to the success of the Tsali daughters, Lewisfield leased him from Hillcrest Stud in Wisconsin and had foals by him from 1963 to 1966. Lewisfield Faarseyn (Ferseyn x Farsaana by Disaan) sire of 24 registered purebreds. Lewisfield brought in several groups of horses from the West Coast from 1961 to 1963 who had a major impact on breeding in the East and Midwest. 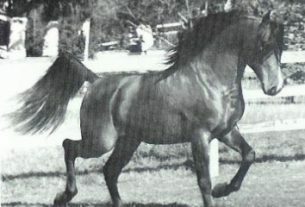 In 1961 a group from the Tone Ranch arrived from California, including Fadneyna (Fadjur x Ferneyna), halter champion Fadjurnina (Fadjur x Munira), and halter champion Fadi (Fadjur x Saki). Lewisfield kept Fadjurnina for a while breeding the excellent mare Lewisfield Paloma (by El Gato) from her, but Fadi was almost immediately resold to Kenneth Kettenhofen of Wisconsin. 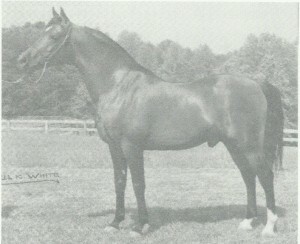 During the same period Lewisfield also acquired two Egyptian lineage mares, both full sisters by Disaan out of Farroufa. They were Ansara (dam of champion producer Lewisfield Imafay and National winner producer Lewisfield Sunana for Lewisfield as well as two champions for other owners), and Farsaana, dam of U.S. Top Ten English Pleasure AOTR, Lewisfield Nizaan++ and halter reserve junior champion Lewisfield Nizana (both by *Nizzam), halter champion Lewisfield Sunny (by Lewisfield Sun God), and the champion producers Lewisfield Faarseyn and Lewisfield Faarseyna (both by Ferseyn and part of an apparent three-in-one deal with their dam). In 1962 the Lewises made their first major sale – to Kenneth Kettenhofen, already mentioned as the buyer of Fadi. He bought a total of 28 horses and resold them, including Fadi (who brought a reported price $50,000) in 1963 to a group of Wisconsin businessmen who founded the noted breeding farm Heritage Hills. Included in the group sold to Kenneth Kettenhofen were a number of the Ben Hur champion producers as well as Lewisfield Reverie and Lewisfield Faarseyn. It was this group from Lewisfield which formed the nucleus of success for Heritage Hills, one of the top breeders of National Champions in halter and performance during the 1970′s. El Gato (Ferseyn x El Sikada) a champion at halter and park classes. From “The Look of Eagles” farm brochure. Paul K. White photo. Another connection to Heritage Hills was made in 1963 when Lewisfield bought the Ferseyn son El Gato 9075 (x El Sikada) and his son El Magato (x Marharetta) to the east. El Gato was a halter champion before his purchase and Lewisfield showed him to several park championships. El Gato stood at stud at Lewisfield through 1966, when he was resold to Marianne Hannah of California. At Lewisfield he sired 1977 and 1978 Region 15 Champion Park Lewisfield Falcon (x Winsome Lass), halter reserve champion Lewisfield Zorro (x Aazkara), halter champion Lewisfield Gusto (x Imafara), and English pleasure champion Lewisfield Lobo (x Aazkara). His son El Magato was advertised at an introductory fee of $200 at age two and was immediately bought by Heritage Hills. He sired nine National winners there, including U.S. National Champion Mare Heritage Desiree, and his daughters are noted broodmares. One, park champion Heritage Reverie (x Lewisfield Reverie) produced three champions and two National winners, so his sale to Heritage Hills was a loss for Lewisfield as he bred mares at Heritage Hills who were originally from Lewisfield. Lewisfield Nizzor++ champion stallion produced by the Lewisfield breeding program. Twice U.S. Top Ten Western Pleasure & East Coast Top Five Stallion. Faydette photo. In the early 1960′s Lewisfield also acquired a daughter and several granddaughters of *Raffles. The *Raffles daughter Freni was 75% Crabbet and 25% Babson Egyptian. She produced two champions at Lewisfield: park reserve champion Lewisfield Dancer (by *Touch of Magic) and U.S. National Champion Park, Formal Driving, and Formal Combination Lewisfield Nizzof (by *Nizzam). Lewisfield also purchased two daughters of the double *Raffles son, Raffey: Raffbah (x Bahia) and Raffwe (x Weda). Raffwe produced halter champion Lewisfield Nizzwe and English Pleasure reserve champion and champion producer Nizzaff (both by *Nizzam) and the champion producer Lewisfield Allure (by Aaraf). 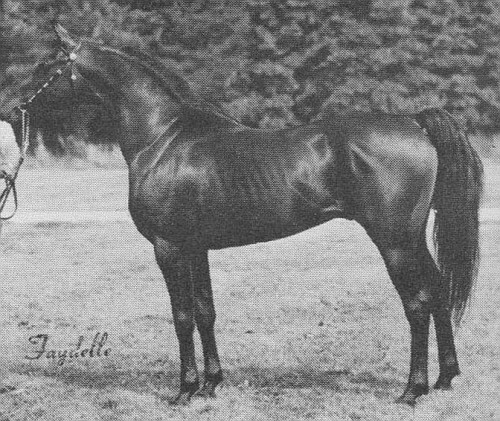 While at Lewisfield, Raffbah produced three champions and four champion producers: champion producer Lewisfield Nizzba and twice U.S. Top Ten Western Pleasure and East Coast Top Five Stallion Lewisfield Nizzor++ (both by *Nizzam), junior halter champion and champion producer Lewisfield Gizama (by Gidazam) and English pleasure reserve champion and champion producer Lewisfield Bahraff (by Azraff). *Nizzam, a most significant sire in the Lewisfield breeding program from his importation until his death in 1970. 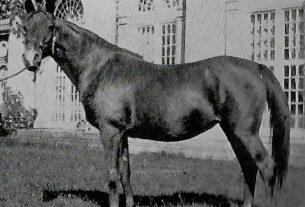 Lewisfield’s most significant sire after his acquisition and until his death in 1970 was *Nizzam, whose success was featured in the last issue of The Crabbet Influence. He sired 41 champions and 13 National winners. Interestingly, 24 of his 41 champions and 7 of his 13 National winners were bred by Lewisfield. The acquisition of *Nizzam whetted the Lewises’ interest in going to England to import Crabbet lineage stock directly. They had also had good success with two Naseem granddaughters acquired in America from their importer. They had leased the park champion and champion producing double Naseem mare *Katina (Naseel x Wardi) from her importer, Annie Riggs of Connecticut. They also purchased Riggs’ Raktha daughter *Alyssa, a maternal half-sister to *Silver Crystal. Both mares produced fine daughters by *Nizzam – *Alyssa produced the champion producer Lewisfield Nizala and *Katina produced Lewisfield Nizaka (also a champion producer). So, off the Lewises went to England to acquire more Naseem line stock to cross with *Nizzam. Since *Nizzam was a Naseem grandson and linebred to Naseem’s dam Nasra, the Lewises would be linebreeding to both Nasra and Naseem with their new acquisitions. The first group of Lewisfield imports was brought to America in September 1963. It consisted of 12 horses: nine mares (two were in foal) and one stallion. Seven of the nine mares produced American champions, and one of the in-utero foals was named an American National Champion. The stallion imported with the group, *Touch of Magic, sired National winners. The imports will be discussed here in alphabetical order. *Blue Tango (by Blue Magic) was the in-utero colt of *Shaybet, who was also in the importation. He was a double grandson of the Rissalix son, Blue Domino. Unfortunately he left no registered foals – his own photos as a colt show him to have been a fine individual. *Doro (Dargee x Rasana) was a paternal half-sister to U.S. Top Ten Mare *Silwara. She produced six American foals, two of them Lewisfield-bred: halter champion The Heiress and 1973 Region 8 Champion Western Pleasure Lewisfield Doran, both by the *Nizzam son Lewisfield Nizzamo. *Fire Opal (Dargee x Wentworth Golden Shadow) had 13 foals in America, six of them for Lewisfield. Her daughter Lewisfield Nizopa++ (by *Nizzam) is a halter and park champion, the 1973 U.S. Reserve National Champion Pleasure Driving and a champion producer. Nizopa’s full sister, Lewisfield Nizza, is a dam of two champions including U.S. Top Ten Informal Combination and Pleasure Driving and Canadian Top Ten Native Costume BL Indian Velvet+. *Fire Opal’s son Lewisfield Cortez (by Stonewall Jackson) is a junior champion at halter. *Flying Storm (Indian Magic x Taima) had four foals in America, three of them for Lewisfield. Her last foal (not bred by Lewisfield) was U.S. Top Ten English Pleasure and English Pleasure AOTR, Magic Aurab+ (by Aurab). *Golden Fairy was a daughter of Dargee’s full brother, My Man, and 1966 British Supreme Champion Mare Sugar Plum Fairy. She had twelve foals in America, two of them for Lewisfield. 1970 U.S National Champion Western Pleasure Lewisfield Magic+/. Sire of champions. Lewisfield Magic+/, the in-utero foal of *Michelia, was by Indian Magic. 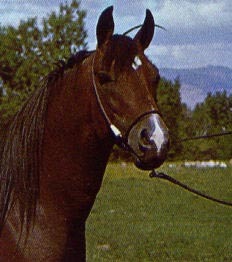 He was a halter and English Pleasure Champion, a park reserve champion, and the 1970 U.S. National Western Pleasure Champion as well as sire of a National winner. He was not used in the Lewisfield program as a sire, he is (was at time of printing) still alive at Warren Park Stud in California. *Michelia (*Count Orlando x Rissalma) was a granddaughter of *Count Dorsaz. She proved to be the best producer of the importation. Of her six American foals, three are National winners: *Lewisfield Magic+/, 1975 U.S. Top Ten English Pleasure Lewisifield Lulu++ (by *Touch of Magic) and 1981 Canadian Top Ten English Pleasure AOTR Lewisfield Nizzix (by *Nizzam). *Shaybet (Blue Domino x Shayba Thania) had ten foals in America, seven of them for Lewisfield, including 1980 Canadian Top Ten Western Pleasure Lewisfield Nizbet+ (by *Nizzam), one of the last stallions used at Lewisfield prior to dispersal of the stud. 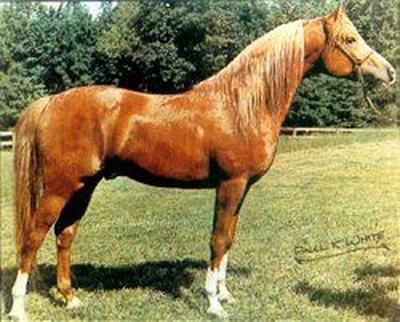 *Silver Belle (Raktha x *Silver Crystal) was a full sister to halter champion *Silwa, dam of U.S. Top Ten Mare *Silwara. 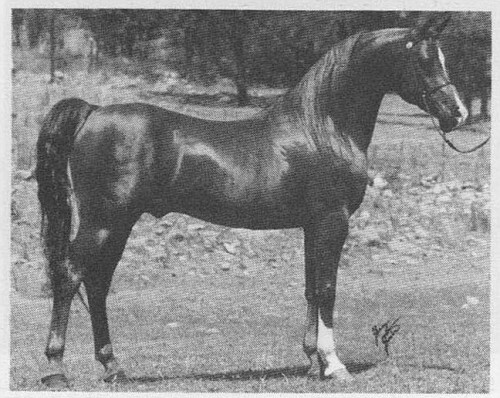 She was 17 at the time of importation and had just two American foals – one the western pleasure reserve champion Lewisfield Nizbal (by *Nizzam). *Solange (Sole Hope x Yanni) had eight American foals, two for Lewisfield. Both of her champions were bred by other breeders. They are: pleasure driving champion Sa’Id Rad, and Region 14 Champion Formal Driving and Scottsdale Reserve Champion Park AOTR, TN Zaubaa+. *Touch of Magic (Indian Magic x *Indian Diamond) at eight years old standing 15.1 hands. From ‘The Look of Eagles’ farm brochure. *Touch of Magic (Indian Magic x *Indian Diamond) was out of an Oran daughter. He was the only stallion in the importation. He sired three American National winners, two for Lewisfield: 1972 U.S. Top Ten Mare Lewisfield Sprite (x Griffin Sprite) and 1975 U.S. Top Ten English Pleasure Lewisfield Lulu++ (x *Michalia). He also sired the Lewisfield bred champions Magiseyn+, Lewisfield Dancer, Lewisfield Dream, halter and English pleasure champion Lewisfield Poem (x Lewisfield Nizzizza) and champion producers Touch of Fantasy and Lewisfield Latigo. *Touch of Magic was sold to the West Coast when Lewisfield dispersed. *Zilla (Indian Magic x Silent Wings) was a full sister to British Junior Champion mare Yemama. She had a total of five American foals, all for Lewisfield. In 1965 the Lewises returned to England to import four additional mares (three of whom produced champions) and their in-utero foals (all by Iridos). *Cheran (Rakan x Simiha) had four lines to Skowronek and her dam was a rare double Naziri mare. She had four foals for Lewisfield, including champion producer Flowerearth (by Lewisfield Nizzamo). She is also the dam of 1988 Region 16 Reserve Champion Sidesaddle SL Count Anthony+ and the in-utero import *Lewisfield Irexa (not used in the Lewisfield program). *Dragonesse (*Count Orlando x Dragonfly) was a paternal half-sister to *Michelia. She had just two American foals. Her in-utero son *Lewisfield Dragon (by Iridos) left no registered progeny. Her son Lewisfield Sorm++ (by Royal Storm) is an East Coast Champion Gelding. *Sirikit (Alexus x Rexeena) had four foals for Lewisfield, including the in-utero colt *Lewsifield Irax (by Iridos), who left no registered foals. *Sirikit died in 1984 at the age of 23. *Snowfire (Kami x Castanea) was the most successful mare of the second importation. She had 15 registered foals, six of them champions. Six of her foals were bred by Lewisfield, including 1977 Region 12 Top Five Mare Lewisfield Sunlea++ (by Lewisfield Sun God) and halter champion Frostbite (by Lewisfield Nizzamo). In spite of his disillusionment, Lewis did acquire a few more horses in the mid and late 1960′s. He was the first breeder to bring horses of McCoy breeding to the East Coast. They had been tremendously successful in California and Lewis acquired a number of them, both mares and stallions. The mares included Arizona (Dunes x Luna), Sara Ann (Dunes x Sara Lyn), Mysin ( Ferseyn x Mysraffa), McCoys Rose (The Real McCoy x Sahara Rose), McCoys Star (The Real McCoy x Sahara Star) and White Rose (The Real McCoy x Sahara Rose). These mares were bred mostly to *Nizzam with some success. White Rose produced three Lewisfield-bred foals, including Region 15 Champion English Pleasure AOTR and halter champion Lewisfield Nizryn+ (by *Nizzam) who also became a sire of champions. White Rose has a total of four champions in all, three bred by other breeders. Arizona had produced three champions before coming to Lewisfield in foal to McCoys Count. She had two foals at Lewisfield. McCoys Rose, a reserve champion at halter, had four foals bred at Lewisfield, including halter champion Shilozon (by Gamuzon). McCoys Star produced two champions bred at Lewisfield: East Coast Top Five Mare Lewisfield Witch (by Lewisfield Nizbet+ by *Nizzam) and halter reserve champion Lewisfield Chato *by SX Gray Eminence by *Serafix). Halter champion Sara Ann produced English pleasure champion Lewisfield Nixeyn (by *Nizzam) and she is also the dam of two National winners for other breeders. Lewisfield stood four stallions bred by the McCoys. First acquired was halter champion Royal Storm (Ferseyn x Bint Sahara). He was bought in 1966 abd used lightly through 1969. His Lewisfield-bred champions are English Pleasure AOTR Reserve Champion Lewisfield Smoke (x Aarafa) and Legion of Merit winner and East Coast Champion Gelding Lewisfield Storm++ (x *Dragonesse). 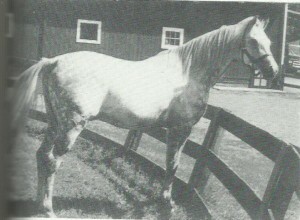 The second McCoy bred stallion used at Lewisfield was halter champion Silver Storm (The Real McCoy x Sahara Dawn) purchased in 1966 and resold in 1968 to Mr. and Mrs. Philip Katzev of Bonnie Acres Farm in Freehold, New Jersey. He sired four Lewisfield-bred foals, including Lewisfield Besame (out of the Ferseyn granddaughter El Negma). Lewisfield Besame produced three champions: 1983 Region 15 Champion Mare Nadus Moniet (not bred by lewisfield), English pleasure champion and pleasure driving reserve champion Lewisfield Felica (by Sir Felix) and 1979 East Coast Champion English Pleasure and 1983 Canadian top Ten Informal Combination PH Nizizo+ (by the *Nizzam son Lewisfield Nizizo). The third McCoy stallion used at Lewisfield was Stonewall Jackson (The Real McCoy x Sara Lyn), who was originally named McCoys Sensation and had his name changed by the Lewises. He was used from 1968 through his sale in 1972 at the September Beehive Sale in Virginia (he was offered for sale in an ad in Arabian Horse World in October 1971 for $15,000). He was used mainly on the imported mares, as Royal Storm had been. His Lewisfield-bred champions are junior halter champion Lewisfield Cortez (x *Fire Opal) and 1985 Region 15 Top Five English Pleasure and Pleasure Driving and 1986 Region 15 Reserve Champion Pleasure Driving and Informal Combination Lewisfield Appolo (x Lewisfield Nizziza by *Nizzam). Lewisfield Appolo, one of the last horses bred at Lewisfield, sired 1986 East Coast Top Five English Pleasure and 1988 Region 12 Reserve Champion English Pleasure JOTR, Appolo Joshaviah. The final McCoy bred stallion at Lewisfield, Sahara Prince (The Real McCoy x Sahara Queen), stood from 1969 through 1971. His Lewisfield-bred get include champion producer Lewisfield Pearl (x Lewisfield Joy) and 1982 Region 7 Reserve Champion English Pleasure AOTR, Lewisfield Sahara (x Lewisfield Serenade by Aaraf) and Lewisfield Nomad (x Lewisfield Godess by Gidazam), a colt so good Lewisfield offered him for sale as a two year old for $15,000 – the highest price on the sales list. After Lewisfield dispersed, Sahara Prince returned to California and was named 1973 Region 1 Top Five Stallion. By the end of the 1960′s Lewisfield had sold all of the early sires used and *Nizzam died in 1970. The Lewises experimented briefly with *Serafix blood. Their first *Serafix son, Royal Lancer++, a maternal half-brother to El Magato, was bought in 1966 but resold in 1967. (He later became a Legion of Merit winner.) SX Symphonette (*Serafix x Cobah) was owned by Lewisfield in 1972, as was halter champion SX Gray Eminence (*Serafix x Chloeyn), sire of halter reserve champion Lewisfield Chato. 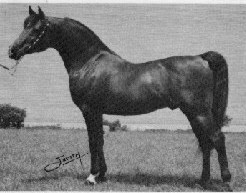 Lewisfield also purchased the *Serafix grandson, halter champion Sir Felix (by Witezfix++), whom they used at stud as a two and three year old in 1971 and 1972. His Lewisfield-bred champions are English pleasure champion and pleasure driving reserve champion Lewisfield Felica and 1979 Region 15 Champion Sidesaddle and Reserve Champion English pleasure AOTR, Kimbryer Felixia+ (x Lewisfield Doll by Lewisfield Nizzamo). Unfortunately the Lewisfield breeding program did not last long after the acquisition of the *Serafix stock; it would have been fascinating to see how it would have blended with *Nizzam and *Touch of Magic mares. *Serafix did well when used to linebreed to Raktha (U.S. Reserve National Champion Mare SX Geniis Pride+++ and U.S. Reserve National Champion Pleasure Driving Magic Genii++ are good examples), so one might guess that *Serafix blood would have worked well to linebreed to Naseem with the sources the Lewises already had. The last stallions acquired by the Lewises were obtained in the year before they dispersed the herd. They were both sons of Ferzon, who was bred by Frank McCoy, so were genetically similar to the McCoy bred sires previously used. They were 1971 U.S. Top Ten Stallion Gamuzon (x Amunet) and halter champion Gai Ellazon (x Gaella). Both sired two Lewisfield-bred foals each. Other sires used at the end included the *Nizzam sons Lewisfield Nizrif (x Aarafa), Lewisfield Legacy (x Aazrafa) and Lewisfield Nizbet+ (x *Shaybet), the Lewisfield Sun God son Lewisfield Sunraf (x Raffbah), as well as Lewisfield Amigo (Tsali x Griffin), a sire of champions and sire of National Champion producer Amnesia (whose daughter Crystal Lace is the 1986 Canadian National English Pleasure JOTR Champion).